It’s the last day of 2015, and it’s time to be thankful for the year that’s past. Sometime’s it can be hard to find the positives, as it feels we are hard wired to only focus on the negative stuff. The celebrations are big here in Scotland. Every major city has it’s own celebrations. From the Edinburgh Street Party to Stonehaven’s Fireball Ceremony, and lots of fireworks. Thousands of people will celebrate it public parties, but celebrating in home is also part of the Hogmanay fun. As soon as the bells toll at midnight, people start knocking on the doors of their neighbours, to wish well for the year ahead. This is called first-footing, as in the first foot through the door. If the first person through your door is tall and dark, it’s seen as good luck. 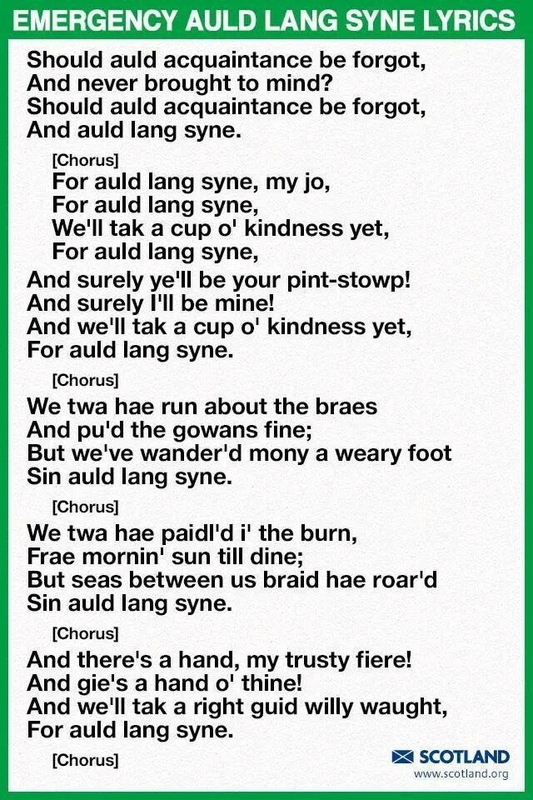 One of the most famous part of the Hogmanay celebrations is the singing of Auld Lang Syne written by Rabbie Burns. It’s become popular all over the world when celebrating the new year. So, to help you prepare for the singing of the song, I have put the lyrics below. Thank you if you have read any of my posts this year, I really appreciate it. And I also wish you all a braw Hogmanay and a bonnie start to 2016. Cheers. This entry was posted in Uncategorized and tagged 2016, auld lang syne, celebrate, hogmanay, lyrics, new year, rabbie burns, robert burns. Bookmark the permalink.